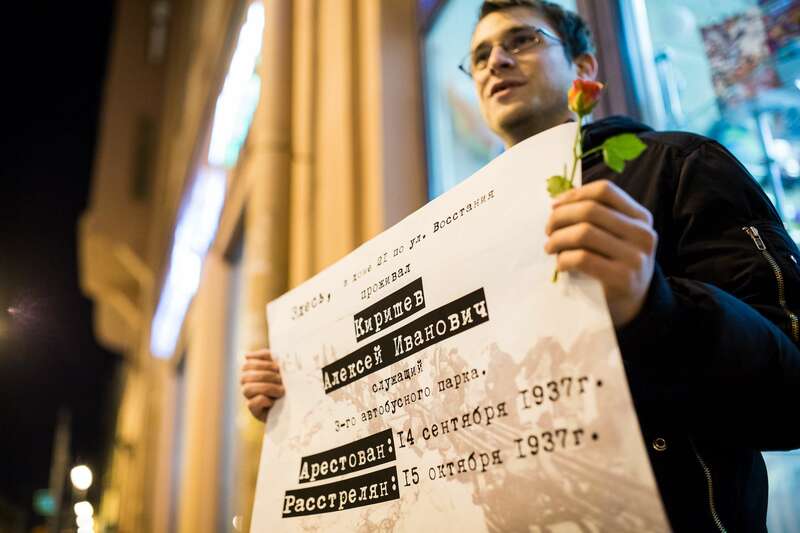 On October 30, the Day of Remembrance of the Victims of Political Repressions, the Vesna (“Spring”) Movement organized a memorial event entitled Immortal Gulag, by analogy with the popular annual memorial event Immortal Regiment, held on Victory Day (May 9), during which crowds of people march through the streets of Russian cities bearing portraits of their relatives who fought in the Second World War. 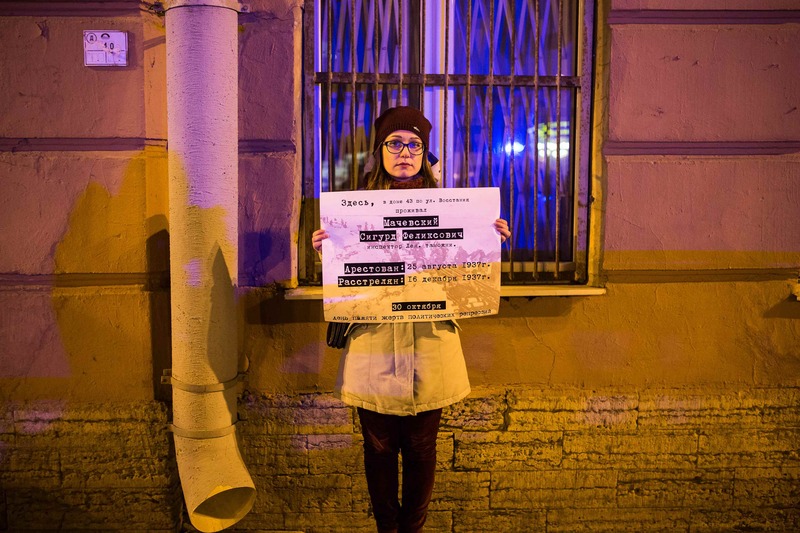 As solo pickets are the only form of public protest in Russia that does not require prior permission from the authorities, and most people are reluctant to attend unsanctioned street protests, Vesna decided to held series of solo pickets on Vosstaniya Street in downtown Petersburg. The activists stood in front of buildings holding posters bearing the name of somebody who had lived in the building and was arrested and executed during the Great Terror of 1936–1938. 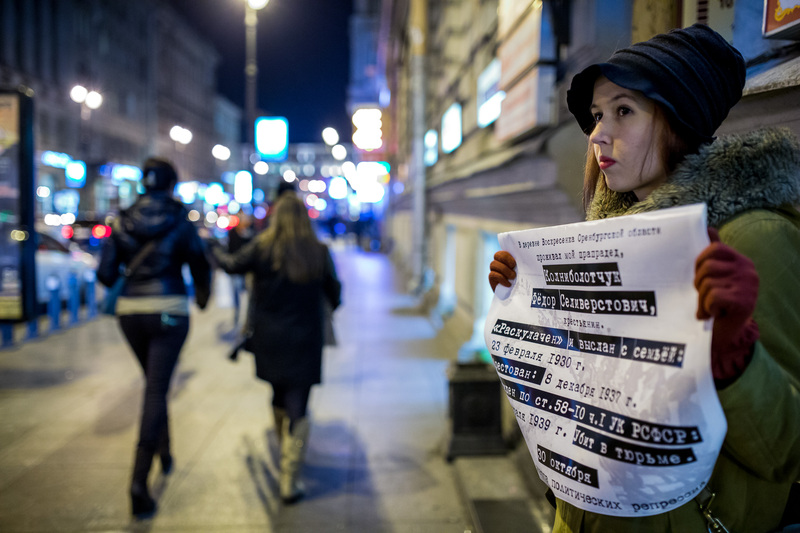 Despite the fact that the event had been heavily promoted, only thirty-some people took part, most of them Vesna activists and their friends. Another disappointment was the fact that the posters contained the bare minimum of information about the Terror victims: their names, professions, and dates of birth and execution. 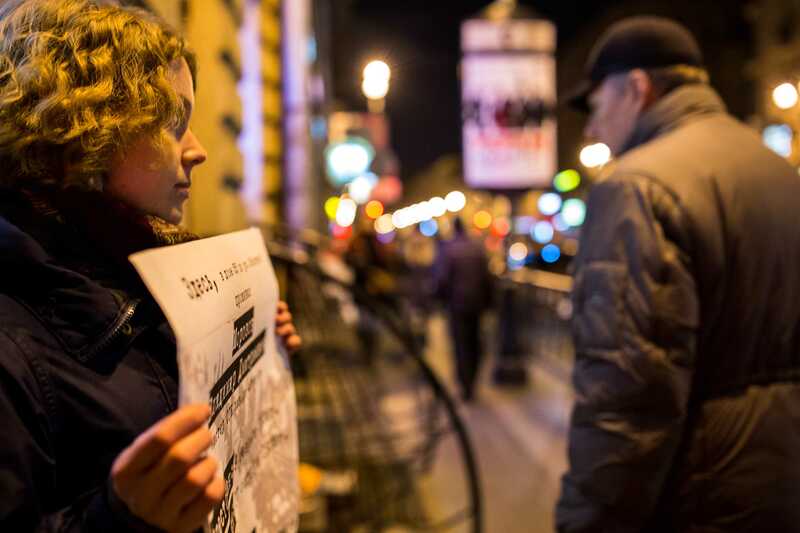 There was only one line in small print at the bottom of each poster reminding passersby that October 30 was the Day of Remembrance of Victims of Political Repression. 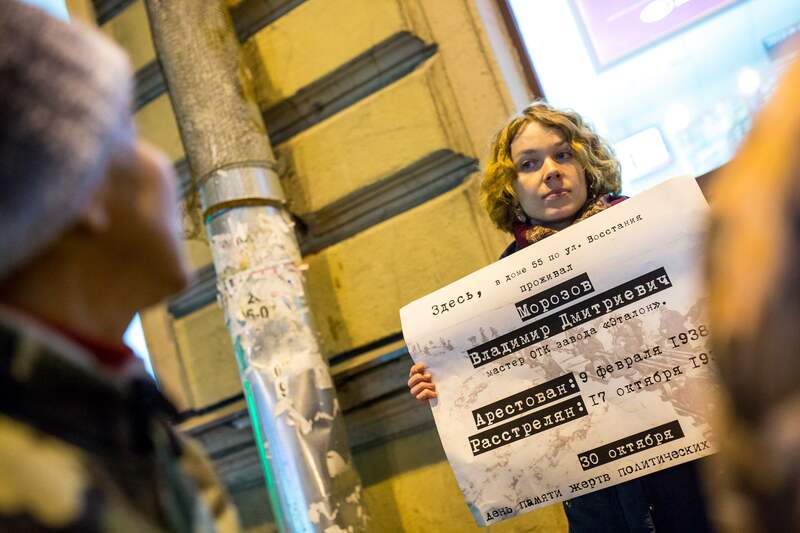 A pack of torn-up posters found in a trash bin also raised eyebrows, triggering unpleasant associations with discarded “granddads on sticks” from certain Immortal Regiment events, which had provoked a storm of protest on Russia social networks. Most passersby who stopped to read the posters reacted positively. Some shared stories of their own families, while others nodded and said, “We support you.” One woman even handed out flowers to the activists. As usual, other passersby sought to link the event with evil plots by the US State Department or the Ukrainian government, but there were few such people. One standout among them, Andrey Yazov, posed as a journalist and attempted to “troll” the activists. He even subsequently posted a video on his page on the Russian social network VKontakte. In the video, entitled “Trolling Vesna,” he asks the activists whether the Terror victims had not, in fact, been criminals. He clearly loses his interest when he learns that Soviet authorities later exonerated all of them. He does, however, reveal the sensitive fact that not all of the activists studied the biographies of the people whose posters they held. On the other hand, two participants held posters bearing the names of their own relatives. As during other such memorial events, most passersby sped past the activists without visibly paying any attention to them. All photos by and courtesy of David Frenkel. The Memorial Research and Information Centre in Petersburg has recently launched a searchable online version of its Leningrad Martyrologue, a catalogue of local victims of the Great Terror (in Russian), in concert with the Last Address project. Curious readers should also look at Laboratorium 1 (2015), Gulag Legacy: Spaces of Continuity in Contemporary Everyday Practices, ed. Olga Ulturgasheva (in Russian and English), published by the Centre for Independent Social Research (CISR), recently declared a “foreign agent” by the Russian Ministry of Justice.